Plymouth Argyle chief Derek Adams declared it was ‘excellent business’ to sell attacker Jake Jervis to Luton on deadline day. The Hatters are believed to have met the £125,000 buy-out clause in Jervis’s contract which meant he was free to discuss terms at Kenilworth Road, and with the forward a free agent in the summer, then Adams felt it made good sense to recoup a fee for him now. He chose to go because he has got a very lucrative contract with Luton. 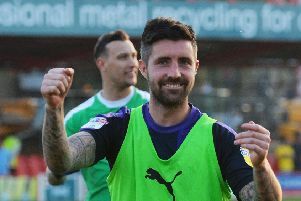 Speaking to the Plymouth Herald, Adams also stated that the financial reward of joining Luton played a part too, as he said: “We are absolutely delighted. “It’s excellent business to do for somebody who we took in for nothing and had five months on their contract to run. “He wasn’t in our team, and hasn’t been for a number of weeks now and it just depended on which club he went to. “Walsall were in for him but Luton came in very late (on Wednesday) and he ended up going there. “We were put in a situation where the buy-out clause was met and he had the opportunity to stay or go.